Orbital ATK has signed a deal worth nearly $100m dollars to provide Orion’s Launch Abort System (LAS) through to the second mission for the Space Launch System (SLS). The deal also covers an Ascent Abort test (AA-2) – which will be conducted in-between the maiden flight of SLS in 2018 and the second flight in the early 2020s. 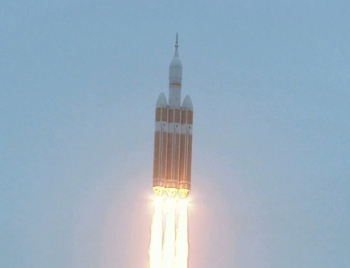 The current generation of LAS for NASA was born out of the work associated with the since-defunct Vision for Space Exploration (VSE), as NASA opted to revert back to a capsule design, with a full Launch Abort System. This was considered a top priority for the future of crew launches, as NASA moved away from the Shuttle era and its lack of options for saving the crew during an ascent failure. The trades requested that the preferred design should ensure the risk of losing the crew in an abort scenario would be no greater than 1:10, noting such a system is no guarantee for crew survival during an emergency. The primary role of such a system is to save the crew during the ‘three stages’ of an abort, the first – known as a Pad Abort – involving the firing of the spacecraft (Orion) away from a failing vehicle on the launch pad to a safe distance, before deploying the parachutes for a landing in the Atlantic ocean within a 3450 ft radius due east of the launch pad. The second stage of an abort is noted as “mid altitude” – which has a different characteristic when compared to the Pad Abort. This stage of abort works for up to 150,000 ft, involving the LAS remaining on the vehicle after firing the Orion safely away from the failing vehicle until the point of drogue chute deployment, which becomes necessary at that altitude. The first major test of the LAS was conducted during the Pad Abort-1 test (PA-1) held in May 2010, which used the abort motor development design. That test involved a boilerplate Orion being launched into the skies of White Sands, New Mexico. An inert LAS was then provided by Orbital ATK for the EFT-1 Orion flight test at the end of 2014. 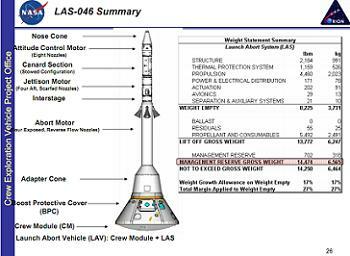 Despite being an inert motor, the LAS provided vital data to the engineering teams as it launched with the EFT-1 Orion atop the United Launch Alliance (ULA) Delta IV-Heavy. “The EM-1 flight will use another inert abort motor, which must meet the flight thermal and structural requirements. Except for live propellant, the EM-1 will use the abort motor operational design,” noted Orbital ATK last year. The test will be a mid-altitude abort from an Abort Test Booster (ATB), with the trajectory designed to achieve desired test condition, such as altitude, mach number, dynamic pressure, Angle of Attack, among other test objectives. “The abort motor design for the AA-2 flight test will be the operational design with live propellant. 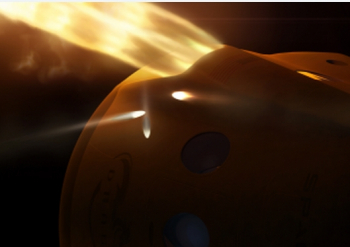 It will validate abort motor performance during ascent,” ATK added. 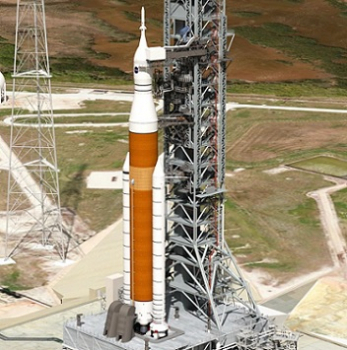 There is, however, the potential that the second SLS flight will also be uncrewed – around 2020 – possibly involving a cargo mission, which would potentially preclude the use of the LAS. Technically, the EM-2 mission involves a crew launching to an asteroid, which is not expected until the mid-2020s. An interim flight between EM-1 and EM-2 would also allow for the debut of the powerful Exploration Upper Stage (EUS) workhorse, should an uncrewed “human rating” flight be required. Regardless of the plans under consideration, Orbital ATK announced it had sealed a deal with Lockheed Martin to provide the LAS through to the second SLS mission that requires it. Under the recently signed agreement, the primary objective is to complete design, development, test and qualification of the abort motor. Major milestones in the process include structural tests, loads tests, igniter open air tests, and motor static firing tests. These tests will ultimately qualify the abort motor for operational flight missions. The agreement with Lockheed Martin provides funding for the launch abort motor through the second launch of Orion on SLS, EM-2 and is worth $98 million. “Orbital ATK is proud to be a key contributor to the Orion program and to astronaut safety,” added Fred Brasfield, Vice President of Orbital ATK’s NASA Propulsion Programs. While NASA’s preference is to utilize the solid propellant LAS tower option, SpaceX recently completed a successful Pad Abort test of its liquid fuelled abort system, utilizing SuperDraco engines that will be tasked with multiple roles, including the future goal of propulsive landings. The LAS abort motor will be manufactured at Orbital ATK facilities in Magna, Promontory and Clearfield, Utah – while in a separate contract with Lockheed Martin, Orbital ATK will also provide the LAS attitude control motor, which is manufactured at the company’s Elkton, Maryland facility. Orbital ATK is also providing the five segment Solid Rocket Motors that will provide the majority of the lift for SLS during first stage flight. The company is currently preparing – via the casting of segments – to follow up its successful QM-1 static fire with the second and last test, QM-2.